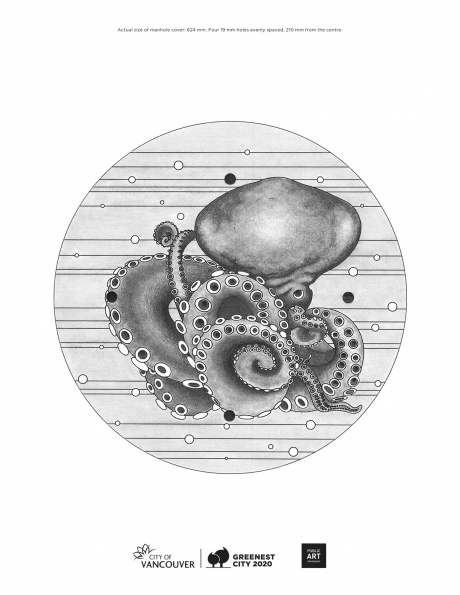 This proposed man hole cover design is representative of an octopus as a reminder of the other animals that are affected by how we use our storm and sewer systems. I also chose it for the design patterns that the many tentacles and curvilinear arms offered. The entire octopus is constructed from ellipses, either whole or intersecting so that it can be viewed abstractly as an elliptical study from any angle. It is modelled from a specimen at UBC's Beaty Biodiversity Museum which resides in a glass jar that is only a few inches in height.